In a campaign ad aired at a cost of millions, Democratic presidential candidate Barack Obama promised a rescue plan for the middle class in tough times Wednesday night as he reached for victory in his 21-month quest for the presidency. 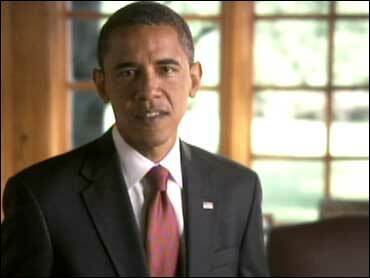 "I will not be a perfect president," Obama said in the commercial. "But I can promise you this - I will always tell you what I think and where I stand." Aides described the unusual ad as a final summation of Obama's campaign. They put the total cost at roughly $4 million, enough to show it simultaneously on CBS, NBC and Fox. It also was running on BET, Univision, MSNBC and TV One. In the spot, Obama asked voters to "choose hope over fear and unity over division" in Tuesday's election. Republican John McCain derided the event as a "gauzy, feel-good commercial" paid for with broken promises. Across 30 minutes, the ad blended views of Obama speaking in a setting that resembled the Oval Office, at the Democratic National Convention and elsewhere. It also included scenes of Americans discussing their economic and health care troubles and testimonials to the Democratic presidential candidate by politicians and business executives. "Ronald Reagan had 'morning in America,' but this 30-minute infomercial had the feel of 'mid-morning in America,' said CBSNews.com senior political editor Vaughn Ververs. "Obama's message of change and hope is a powerful one and the primary reason he is clear front-runner in this election. As the examples his campaign chose to highlight in their made-for-Hollywood ad illustrated, however, the message runs up against a harsh reality. It will be up to voters to decide whether he can deliver on the promises." The ad showed Obama's wife, Michelle, and his two daughters as well as past photos of his black father from Kenya and white mother from Kansas. The program ended with a live transmission of Obama speaking at a campaign rally in Florida, one of several states where Obama is trying to capture traditionally Republican territory. "we will win this election," he promised. "The time for change has come." Without the money to match the commercial, McCain sniped at the man and the moment. Obama said the nation's neglected problems predate President Bush, but that the economic crisis that erupted a few weeks ago was a "final verdict on eight years of failed policies." Earlier, taping an appearance on the Daily Show for later in the evening, Obama said he had to reassure one of his daughters that the commercial would not pre-empt all programming.